Filmed in an ethereal crisp black and white by David Lean, Hobson’s Choice is a beautiful little gem of a movie. 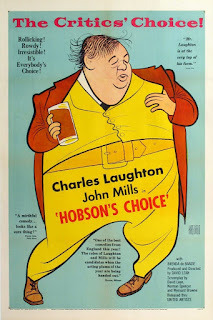 A Hobson's Choice refers to a choice that's not really a choice. 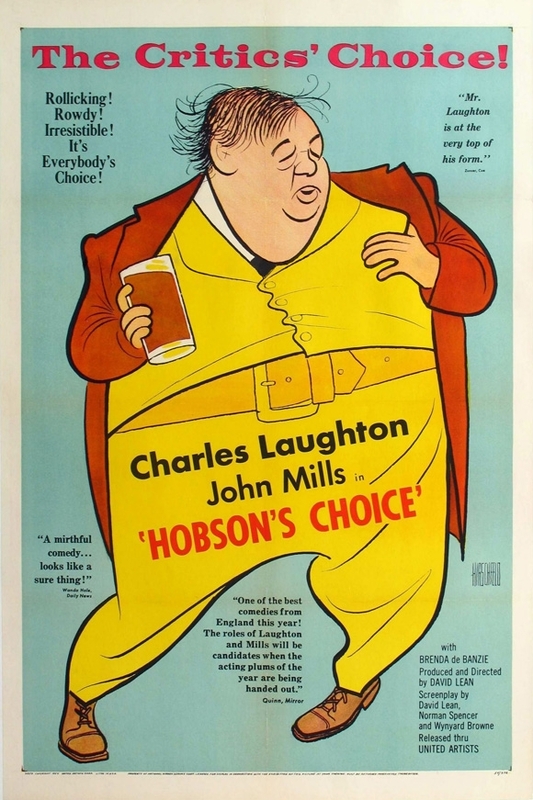 The film stars Charles Laughton as the pompous Henry Horatio Hobson, the often inebriated owner of a bootshop in late Victorian norther England. Brenda De Banzie, an English stage actress, plays Hobson's proto-feminist daughter, Maggie, a feisty and independent woman of nearly 30, who already runs Henry's shop in place of her late mother. When Hobson in a fit of stinginess refuses to pay settlements so his younger daughters can marry, elder daughter Maggie decides to find her own husband and make her own future with Hobson's best bootsmith, Will Mossop (played by John Mills). Oh it's a head to head battle of wills alright between the crusty old patriarch and his bumptious daughter and you can guess who wins. The film weaves a delightful tale in which the blustery Hobson gets his comeuppance in fine fashion as Maggie proves her worth and Will Mossop rises up on his haunches and becomes his own man. It's a beautiful piece of story-telling by David Lean and one of my top ten favorite movies. It's also one of Prunella Scales first film roles as younger sister Vicki. You may remember Prunella from her turn as Mrs. Basil Fawlty in the British TV series Fawlty Towers. This is a lovely little move, a gentle comedy that softly pokes fun at the British class system. The wedding night scene is absolutely the sweetest thing you'll ever see. I watch this film once every year. It makes me happy. 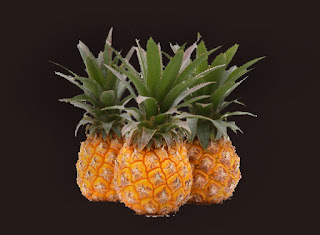 Three pineapples to this wonderful bit of film-making.